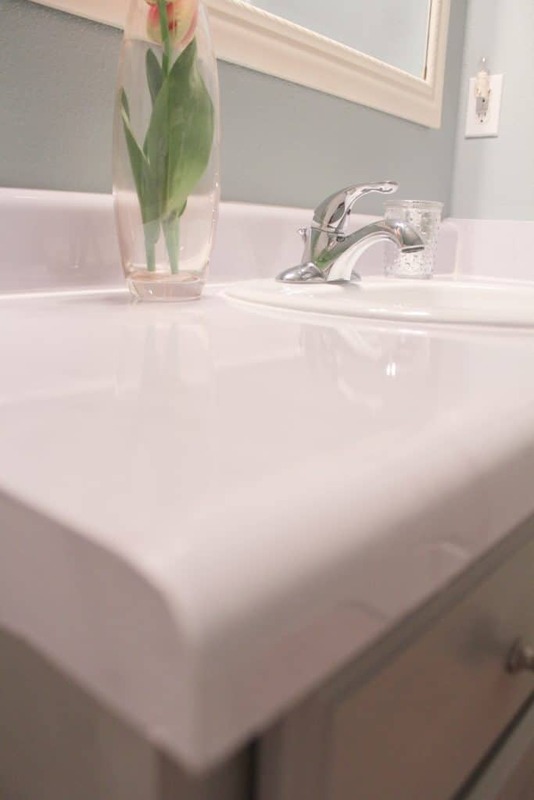 Can you transform a bathroom by changing most of the surfaces, including counter tops, for under $100? YES! 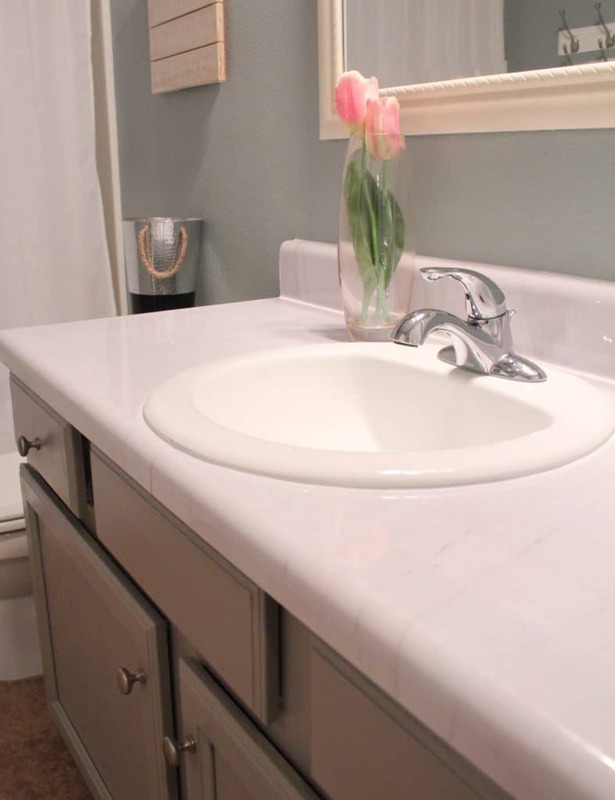 Can you transform a drab formica surface to a beautiful faux marble counter top for less than $50? YES! Can you paint the existing laminate cabinets to create a more modern sophisticated look? YES! 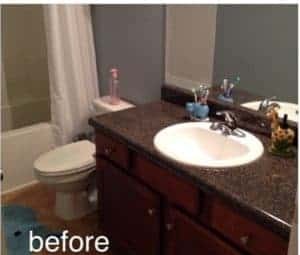 All it takes is a little time and even less money, and I’ll show you how to update a bathroom for under $100 including DIY Faux Marble Countertops. Let’s start from the beginning;First thing on the bathroom update to-do list was to get rid of the “builder grade” mirror. Friends, it is amazing what an actual framed mirror can do for the look of a bathroom. It’s easy to slap a piece of glass on a wall, but it also makes it look cheap. Then I painted the cabinets, because, well, why not! The rest of the colors in this bathroom were going to be light and bright, so I needed to get rid of the brown. On a whim one day I switched up the dated light covers with a few lamp shades I found that we weren’t using. Another little crafty project I created for this bathroom was my DIY wall pallet sign. 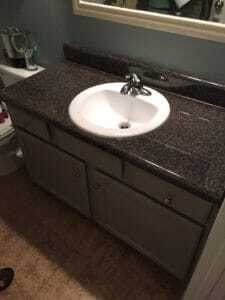 Lastly, we transformed the terrible black speckled formica to a beautiful faux marble countertop. Yes, you heard me right, it really is instant (well, sort of). This is a PVC vinyl “film” with a no bubble backing that makes it easy to install. It is Fade resistant, easy to clean with most household cleaners, and you can remove it without damaging the old counter. This stuff also has a honeycomb grid pattern that creates air channels that help release the air bubbles to make install much easier! The color I chose was called White Italian Marble and I couldn’t be happier. I won’t go into all the details of the install, because Instant Granite does a great job of explaining everything and creating great videos. In my opinion, it is best to have two people for the install if it’s your first time. Now that I’ve completed one vanity, I believe it will be much easier for me to complete another one on my own. There is a small learning curve in the beginning. I thought I could lay the counter top AND backsplash down in one piece (because the old countertop is one piece), but we couldn’t get it to look right. Take your time and don’t be afraid to pull the vinyl up and start over. The product is very easy to work with, and very forgiving. I think I pulled it up at least 3 times at first, just trying to make sure all the air bubbles were gone. Don’t be afraid to caulk! I had seams on every corner, and caulking made all the difference in how the final product looked. The caulk hid the seams, and also made it look more real. Now I feel like I have a new modern farmhouse style bathroom, for UNDER $100! Updating a space doesn’t have to break the bank. 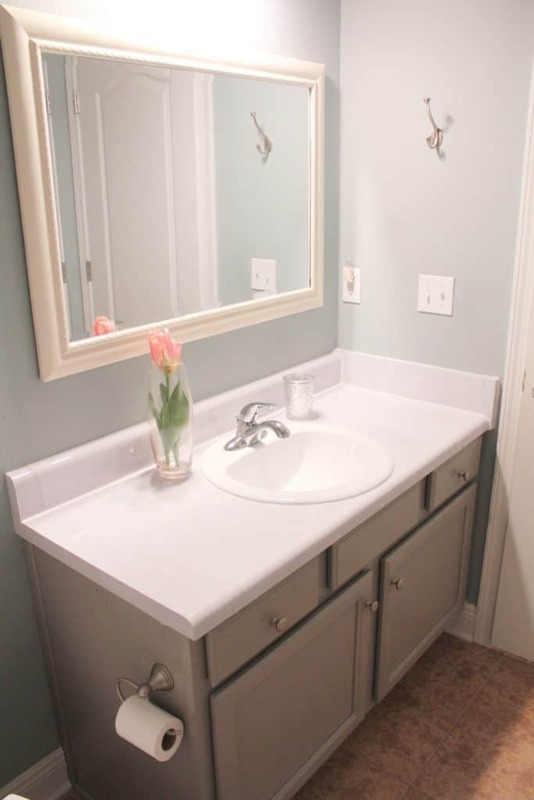 With a little time and effort, and only $100, you turn a bathroom from drab to fab! That instant countertp looks interesting. You can frame the mirror stuck to the wall…probably $10. 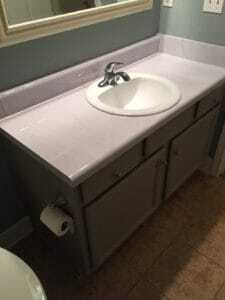 Just get trim molding – nails, caulk and paint. Yes I have framed a mirror before, and it worked great! Looks great! Thanks for sharing on the Pleasures of the NW’s DIY party! Very nice!! Your bathroom looks so fresh and welcoming. Love it! Also love the blue paint wall color. Do you happen to remember the brand/name of wall paint you used? Love the whole room! Great job!! You know, I have been looking for that color swatch for months now! I’ve had a handful of people ask that same question. I’m sorry I don’t have an answer for you now, but if I find it I will let you know. The faux marble form looks interesting. How does it look and hold up? The faux marble holds up great. It has the same heat resistance and durability as a melamine or laminate product. You can scrub it and disinfect it just like you would any old counter top. Hope that answers your questions. I’m stopping over from the Craft Schooling Sunday linkup! The Instant Granite looks really cool! 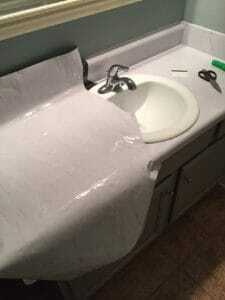 It looks like a good alternative to replacing an entire countertop. Our previous home had one of those builder grade mirrors & I hated it! I actually picked out a framed mirror for our new home & I love the impact it makes. This is so much nicer and brighter than it use to be. I love a bright bathroom, it makes all the difference. Love your makeover. Thank you Leanna, I’ve been pleased with it! I was super pumped to run across this product and I’ve been really pleased with it. Thanks for the pin! I love this! I think your counter top is amazing! I’ve been looking for a way to upgrade my kitchen counters without having to completely replace them. Do you think this type of product would work or is it better on a smaller counter? Yes it would absalutely work on a large space too. If you go here https://www.instantgranite.com/diy/ you can check out other bloggers who have transformed their kitchen with this product! Found you through Sincerely Paula’s blog link-up. This looks amazing!! I recently used a bit of the faux marble adhesive paper while making over a writing table into a vanity and I could not believe the results! That stuff is awesome! It looks SO real! I bet you just love going into that bathroom now! Thank you! Yes I love the product. I’m glad you like yours too. Have a great 4th of July. Love how light and bright the bathroom now is! And I’m definitely intrigued by the instant granite. Thanks so much for sharing at the #happynowlinkup! What a beautiful transformation! Love the colour scheme you choose and how bright the space is now. Great job! I love how bright and fresh it is now! The instant granite is so interesting! What a fabulous product. And you are so right about a framed mirror. I just got one for my bathroom last year and it makes a huge difference. Beautiful job! 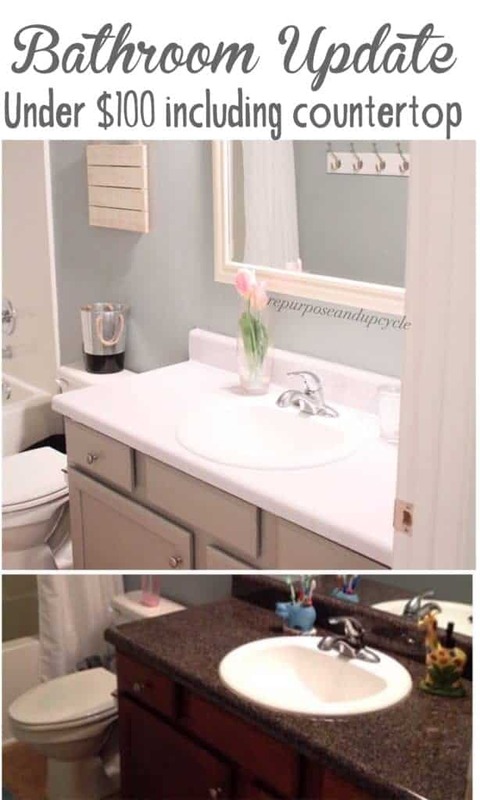 Your bathroom makeover looks great. I love how bright and fresh it looks. Thanks for sharing at Snickerdoodle. Pinning. Love the makeover! What a great transformation. Thanks for sharing at the inspiration Spotlight party. Pinned & shared.